I’d seen hundreds of photographs of the slot canyons before I ever set foot in one. Each seemed more beautiful than the next and I knew that I just had to visit and capture my own interpretations of this dramatic natural wonder. This image was created in Lower Antelope Canyon, one of the famous slot canyons located on the lands of the Navajo Indian Nation just outside of Page, Arizona. These canyons, formed by centuries of erosion from flood waters, are one of the most amazing places I’ve ever visited on this earth.When you descend into the canyons you are presented with a myriad of colors from warm oranges to deep purples. All the colors blend naturally together in perfect harmony. The shapes of the rock formations are virtually limitless. Everywhere you look there is a different, breathtaking, surreal vision before you. The colors in the canyons change as rapidly as the ever-changing light from the sun above. What looks unique one moment takes on a whole new appearance just a few minutes later. The winter views differ radically from the summer experience due to the different height of the sun in the sky. 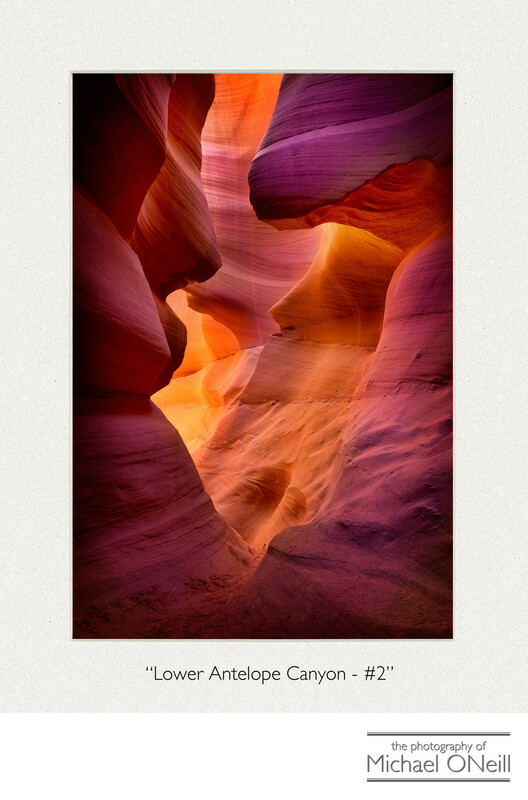 This highly collectible fine art image from a contemporary photographic master is simply titled "Lower Antelope Canyon - #2" the second of an image series I am producing from my trip to this natural wonder. It is available at any size and on any media; and can be acquired directly from the artist by contacting me at my gallery. The image also lends itself to decorators of, and advertisers for, hotels, restaurants and other travel & tourism related businesses. One or more of the series can be displayed side-by-side to create a breathtaking montage of complimentary images culled from one of the most beautiful spots on earth. The image can also be licensed for any commercial use that you may require.